Prior to Java 8, Java developers used to use SimpleDateFormat, which was mutable and not thread-safe and advised not to be shared between threads. In Java 8 and beyond, you can use the DateTimeFormatter class to convert String to LocalDate, LocalTime or LocalDateTime class of Java 8 Date Time API, which represents date, time, and date-time data types. Unlike SimpleDateFormat, the DateTimeFormatter class is both immutable and thread-safe and you can use it as a static variable for sharing and reuse. It also comes with pre-defined date time format like ISO-8601 format. The ISO_LOCAL_DATE_TIME formats or parses a date-time without an offset, such as '2016-03-04T10:15:30'. In this article, I'll show you how to convert a String to LocalDateTime in Java 8, and then back to a formatted String, but you can also check out The Complete Java MasterClass to learn more about new Date and Time API, which is quite vast. In order to create a LocalDateTime object from a string, you can use the static LocalDateTime.parse() method. It takes a String and a DateTimeFormatter as a parameter. The DateTimeFormatter argument is used to specify the date/time pattern. You can also use predefined date formats like ISO_LOCAL_DATE_TIME or can specify by yourself as String into the second parameter. If you are new to formatting instructions, you can see the Javadoc for a complete list. Done, that's all is required to convert a formatted String to convert into a LocalDateTime. If you print or query this LocalDateTime instance, you will find that all date parts like the year, month, date, hour, and seconds are as per given input String. These are just tip of the iceberg of what you can do with the new Date and Time API of Java 8. It's packed with powerful features which makes date and time-related task really easy in Java application. If you want to learn more, I suggest you take a look at What's New in Java 8 course on Pluralsight. It's a short course and you can learn all new Java 8 features in quick time, which will help you to write better code In Java. That's all about how to convert String to LocalDateTime in Java 8. 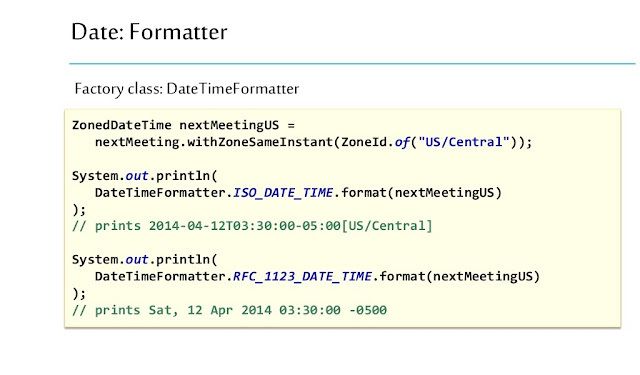 As I said, you can use the java.time.DateTimeFormatter class for parsing and formatting String in Java 8. Unlike DateFormat and SimpleDateFormat of old date and time API, this class is both immutable and thread-safe, and you can also store it into a static variable. In the next part of this tutorial, I'll show you how to convert LocalDateTime to String in Java by formatting date into different patterns. P.S. : If you just want to learn more about new features in Java 8 then please see the tutorial What's New in Java 8. It explains all the important features of Java 8 e.g. lambda expressions, streams, functional interfaces, Optional, new Date Time API and other miscellaneous changes.